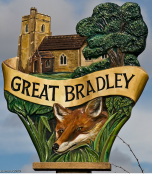 The population of such a small and relatively isolated village like Great Bradley has, understandably, fluctuated over the years. There are many indicators of the population of the village in past years, but until the eighteenth century, in general, women and children were overlooked, and it is only taxpayers or heads of household who were counted. In a few cases widows were included, occasionally counts were made of all able bodied men, and at times of religious unrest the communicants were counted. At the time of the Doomesday survey (1085-1086) there were 52 adult men in Bradley (which had not yet been divided into Great and Little). In 1539 only 12 men aged 16-60 were counted, but a hundred years later this number had risen to 68. As these were musters (to count up for military service) maybe some were unfit and were missed out, so they cannot give us an exact number. However, in 1733 account in the Parish Register of the "number of souls", numbered 271. By 1785 this had risen to 351, and the first form of census counted 395 people in Great Bradley in 1801. There was a steady climb to 542 in both 1841 and 1851, and then began a gradual decline, with the figure for 1931 of only 189 as the lowest on record. The earliest register of the parish dates from 1703 for Baptisms, Marriages and Burials, although "West Suffolk Illustrated" which was published in 1907, records that register's date from 1560. The present whereabouts of the earlier registers is unknown. There has been a steady climb since then, and even with smaller families, the building of the Clarendale and Fox Green housing developments have increased the numbers in the village further. The current population is about 400.